‘It’s a genocide’, was the conclusion of two recent research reports about the treatment of Myanmar’s Rohingya Muslims. Yet despite disturbing conclusions both reports have been criticised for their use of inflammatory language and their pre-election timing. Some argue the publication of a ‘genocide’ conclusion makes it harder to resolve the underlying causes of the Rohingya’s persecution. This article suggests these reports, despite the criticisms, highlight a human rights tragedy that needs to be publicised but that solving this tragedy must involve going beyond labels. Instead, a resolution and peace require working with both major ethnic communities in Rakhine State. Sittwe is a town divided. Barbed wire, sandbags and armed police today separate the Buddhist communities of ‘free Sittwe’ from restricted Muslim areas. It has been this way in the capital of Myanmar’s Rakhine State since 2012, when state-wide communal violence between Buddhists and Muslims left almost 200 dead and around 140,000 displaced (International Crisis Group 2013). Physical separation is part of the authorities’ largely successful strategy to prevent a repeat of this violence but it has come at a terrible price for the state’s Muslim community known as ‘Rohingya’. The Rohingya, a Muslim minority, are denied Myanmar citizenship and the rights and protections that accompany it. Despite claiming centuries of connection to the area now known as Rakhine State, the Rohingya’s heritage is disputed by many in Myanmar who consider them illegal Bengali migrants and certainly not members of an indigenous ethnic national race (Ware 2015). The consequences of this for the Rohingya have been dire. Myanmar’s citizenship laws are based on group rights associated with ethnicity and race (International Crisis Group 2014; Taylor 2015), and the Rohingya’s failure to be included among the country’s 135 recognised ethnic groups has given the government the legal ability to deny them civil, political and economic rights (Burma Citizenship Law 1982; Human Rights Watch 2015). Individuals who previously held citizenship papers have had them removed meaning those claiming their ethnicity as ‘Rohingya’ are now stateless and vulnerable to human rights abuses (Ware & Lee 2015). Today the Rohingya are living in pitiable circumstances and forced to endure deplorable restrictions on travel, economic activity, marriage, and pregnancy outside of marriage (Author’s observations; Human Rights Watch 2013; International Crisis Group 2013). The authorities’ strategy of separating Buddhist and Muslims communities means that, for the Rohingya, large parts of northern Rakhine State resemble an open prison, or worse. Tomás Quintana, the UN special rapporteur on the situation of human rights in Myanmar in 2013 reported receiving credible allegations of, “widespread and systematic human rights violations by state officials targeted against the Rohingya and wider Muslim populations” (OCHCR 2013). The situation has not improved in any significant way since then. My fieldwork in Rakhine State confirms that travel restrictions are having a devastating impact on Muslims’ access to health, education and their ability to earn a livelihood. This fieldwork also confirms the material circumstances of many of Rakhine State’s majority ethnicity, the Buddhist ‘Rakhine’, often portrayed as the instigators and perpetrators of the 2012 violence, are similarly tenuous as they rely on a subsistence rural economy. However, the Rakhine, no matter their poverty, are not subject to the travel restrictions and human rights violations forced upon the Rohingya. The disturbing impact of these restrictions on movement was illustrated by a visit to Sittwe’s Aung Mingalar quarter. Here, around 4500 Rohingya Muslims live in an area no bigger than a couple of square kilometres. It is just a few blocks from the main town market, the hospital and other services, but Muslims are not free to visit these places. Access to Aung Mingalar is tightly controlled by the authorities. Even emergency hospital visits require Aung Mingalar’s residents to seek official approval and doctors visit Aung Mingalar just twice weekly. Residents report unnecessary deaths associated with these restrictions of access to medical care. 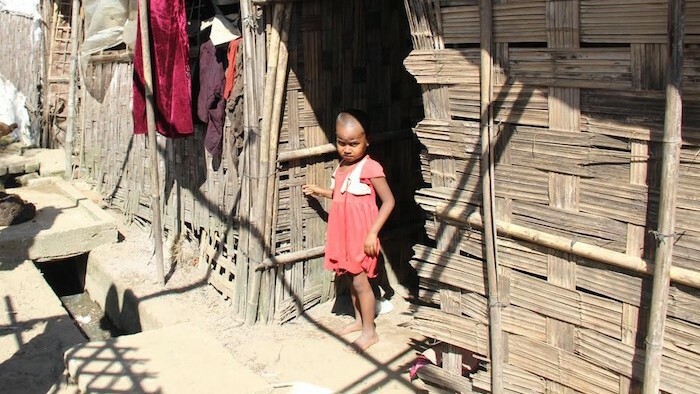 Aung Mingalar’s residents rely for their survival on remittances and support from the IDP camps outside of town and live with the constant fear the authorities could, if they choose, easily cut off access to all medicine or even to food. In Aung Mingalar a ghetto of the worst possible variety has been created. This situation is a disgrace. It reflects terribly on all of Myanmar’s political leaders, and it is made even worse by uncertainty about the residents’ long-term situation: a separation that was originally expected to last just a few months has now been enforced for more than three years. The Rohingya’s situation is so alarming as to warrant the repeated description as a ‘genocide’ by recently published research (Green, MacManus, & de la Cour Venning, 2015; Lowenstein Clinic 2015). The team at Yale’s Lowenstein Human Rights Law Clinic who wrote a report for human rights group Fortify Rights titled ‘Persecution of the Rohingya Muslims: Is genocide occurring in Myanmar’s Rakhine State?’, concluded there is, “strong evidence that the abuses against the Rohingya satisfy the three elements of genocide” (Lowenstein Clinic 2015: 1; frequently referred to as the ‘Yale’ report). This report and another published by the International State Crime Initiative (ISCI), a research centre at London’s Queen Mary University, were published in the days prior to Myanmar’s November 8 general election, timing which guaranteed widespread international media attention. Both reports indicated the Rohingya’s situation could, and in the case of the ISCI, should be described as a ‘genocide’. The ISCI (2015:16) report “concludes that genocide is taking place in Myanmar and warns of the serious and present danger of the annihilation of the country’s Rohingya population”. The Yale (2015: 3) report calls for, “…heightened protection for Rohingya Muslims in Myanmar’s Rakhine State…”. Despite these shocking conclusions, both reports were widely criticised internationally. This is perhaps unsurprising given the long-term nature of the conflict in Rakhine State and the belief by many that the smooth running of Myanmar’s election was important and represented a genuine transition towards a real democracy that should be encouraged. The timing of their publication was considered to be designed to maximise media attention, while their use of the term ‘genocide’ was argued to be needlessly inflammatory. In the Straits Times, Singapore’s widest read daily which prints a Myanmar edition, Nirmal Ghosh’s article ‘Genocide ‘not the issue’ in Myanmar’ draws support from a number of Myanmar experts to argue, according to its tagline, ‘Harping on it [genocide] diverts attention from [the] actual problem of anti-Muslim sentiment’. One of these experts is former senior UN official and International Crisis Group Myanmar adviser Richard Horsey. While acknowledging extreme Muslim discrimination in Rakhine State, Horsey is quoted, “But genocide is not a helpful lens through which to view this situation. An accurate diagnosis is essential to develop the right interventions. Incendiary rhetoric will make that more difficult.” (Nirmal 2015). Soe Win Han (2015), a Myanmar student and guest contributor to New Mandala is more strident in his criticisms. Despite agreeing abuses against the Rohingya do take place, he asserts these are on, “a much smaller scale than the media and human rights groups seem to suggest” (italics in original). Soe Win Han explains that, “Attention-grabbing headlines and name-calling activate fight-or-flight responses, encourage siege mentalities and put compromise beyond reach. Such narratives are not helpful to peaceful resolution of the conflict.”. Soe Win Han makes more criticisms, “…at a time of elections when emotions run high, recent genocide allegations from Yale and other institutions, with their obvious errors and outright confrontational tone, may well play a part in worsening the situation, reversing years of trust-building efforts from the United Nations and other stakeholders on the ground” and “The most disappointing of recent allegations is the report from Yale, released last week. In their paper, there are several inaccuracies which are intolerably obvious to anyone familiar with the matter…”. It is true that authors of the Yale report did not visit Rakhine State nor undertake their own data collection, instead basing their assessments, in large part, on materials provided to them by Fortify Rights. A portion of material they would have been wise to disregard. This point has also been made forcefully by prominent Rakhine-watcher, business advisor and former British diplomat, Derek Tonkin who describes the report to be a, “plethora of factual and historical errors” (Tonkin 2015:3), singling out references to a 2014 incident at Du Char Yan Tan in Maungdaw, northern Rakhine State and close to the Bangladesh border. Initial reports about this incident did not subsequently tally with the facts on the ground yet this information was reprinted in the Yale report. This point led Tonkin (2015:3) to assert, “Yale IHRC have been seriously misled by Fortify Rights over this incident” and he draws the conclusion, “The danger of the Yale IHRC report is that its inaccuracies, omissions and exaggerations undermine the very message of support for the Rohingya people which it is seeking to convey. This does not help the Rohingya one little bit to secure the justice, citizenship and basic human rights to which they are so fully entitled” (Tonkin 2015:4). The Yale report would indeed have been much more helpful in progressing the interests of the Rohingya had the authors undertaken their own fieldwork research and not needed to rely on others for their source material. However, undertaking new fieldwork research was neither their aim nor their job. The Yale (Yale 2015:1) report’s authors made clear upfront that they were, “assuming that the information to which the Lowenstein Clinic has had access is credible and comprehensive and accurately reflects the Rohingyas’ situation…”. It turns out some of it was not and, for some observers, this weakened the credibility of the report’s conclusions. It need not have, however, as there is more than enough evidence publically available and credible about the situation faced by the Rohingya for the Yale researchers to have reached the same conclusion as they did in their report without relying on the provided Du Char Yan Tan material. As for their absence from Rakhine State prior to finding, “…strong evidence that genocide is being committed against Rohingya” (Yale 2015: 1), I strongly doubt these authors would have come to a significantly different conclusion and call for action had they undertaken their own Rakhine research and seen the IDPs or Aung Mingalar for themselves. These are not criticisms that can be made of the ISCI report which reached similar conclusions to the Yale team. The ISCI’s authors undertook research over the course of 12 months which included four months in the field. They conducted 176 interviews, examined documentary evidence and observed the situation in Rakhine State. Unsurprisingly, following this research, they found, “…compelling evidence of State-led policies, laws and strategies of genocidal persecution stretching back over 30 years, and of the Myanmar State coordinating with Rakhine ultra-nationalists, racist monks and its own security forces in a genocidal process against the Rohingya” (ISCI 2015: 15). The ISCI’s well researched report came to a clear conclusion about the disgraceful treatment of the Rohingya. The publication of these reports in the days prior to Myanmar’s election seems to have particularly irked some who were perhaps disappointed the reports’ content risked sullying a positive narrative about democratic transition in Myanmar or that it could inflame tensions and put important compromises in jeopardy. However, surely the dreadful subject matter, conclusions and calls to action of each report demand not only their publication but also their widespread distribution and promotion? When the conclusion is ‘genocide’ surely there should be no encouragement to downplay it? Of course these reports were released at the time they would gain maximum media exposure – they are both suggesting a genocide is underway in Rakhine State so it is crucial to publicise this as widely as possible in the hope the international community will take action. It is difficult to understand how seeking widespread publicity for a report that details allegations of genocide and calls for action to address this, could be interpreted as at all problematic. There is perhaps some validity to the argument that inflammatory language could impact peace-building efforts in Rakhine. At the community level, the Rohingya community did frequently refer to their situation as being ‘a genocide’, and many ethnic Rakhine clearly believe the international community favours providing material and moral support to the Muslims instead of to them. Elites among the ethnic Rakhine Buddhist community are certainly unhappy with both the publicity and the use of the term ‘genocide’ but these voices take issue with virtually all international intervention which they perceive might be to the Rohingya’s benefit. The recent research undertaken by myself and Dr Anthony Ware in Rakhine State indicates there is a large difference between the aggressive anti-Muslim voices of certain elites and the attitudes of ordinary Rakhine Buddhists (Ware & Lee 2015). Our research found that ordinary members of both the ethnic Rakhine and the Rohingya want peace and they broadly agree that peace can be achieved if there is adequate leadership, a commitment to the rule of law, safeguarding of human rights, a citizenship verification process that is transparent, and commitments to economic development of Rakhine State. Our research suggests the biggest challenge will involve overcoming the nationalistic voices of vested interests and powerful people but we suggest the engagement of civil society and faith organisations can help foster the necessary co-operation and renegotiation of identities especially in relation to identity labels. The situation for the majority of Rakhine State’s residents, Buddhist and Muslim, is dreadful, but as both the ISCI and Yale reports document, for the Rohingya Muslims it is tragic. This needs to change. Recent research suggests it can. Both sides want peace and that this can achieved in Rakhine State if there is sufficient political will. But in the meantime we should not allow ourselves to silence those voices highlighting the reality of tragic situations like exist in Rakhine State. Rakhine State does not need silence, it needs change. Green, P., MacManus, T., de la Cour Venning, A. 2015. Countdown to Annihilation: Genocide in Myanmar. London: International State Crime Initiative. Ronan Lee is a PhD Candidate at Deakin University researching the impact of Myanmar’s political and economic liberalisation on the Muslim Rohingya. Ronan’s professional background is in politics, where he was formerly a Queensland State Member of Parliament and has worked as a policy and campaigns advisor. Follow him on twitter @Ronan_Lee.